It's that time of year again when we begin to see the transition from summer to autumn in the beauty world, and that means new shades to wear! Zoya have just released their Focus and Flair collections for Autumn 2015 which are two ranges of five jewel-tone cream shades and five jewel-tone metallics. Today I have the shade Aggie to show you, a metallic, duochrome gold and green/bronze polish from the Flair half of the collection. 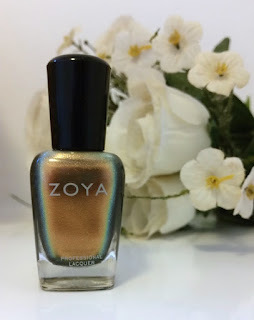 As with all other Zoya nail polishes, the formula is five-free, meaning that it doesn't contain Formaldehyde, Camphor, DBP, Formaldehyde Resin or Toluene. Aggie needs a minimum of two coats at least, more likely three. I've actually applied Aggie twice so far (the first time I had a bit of bubbling from my top coat on a couple of nails so I re-applied the whole lot), the first time using three coats and the second time using two. The colour itself is an absolute beauty. You'll be catching yourself admiring the change between gold and green-bronze on multiple occasions for sure. The green-bronze was pretty difficult to capture on camera, but as you can see in the first, non-flash photo above, I tried to tilt my ring finger so you could see the change on one nail in comparison to the rest. It really comes out as your fingers move though so therefore it is far more noticeable in person. The photos really don't do it justice! The formula itself is easy to work with. It is kind of thin, but the pigmentation is still good which is great! Without a top coat, it doesn't take that long to dry which is pretty helpful if you don't have much time (but with a top coat it will last much longer and be less prone to chips!). Overall, I am in love with this shade. It's perfect for autumn/winter but it is also the perfect transition shade as summer starts to come to an end. If you are a fan of nice, warm metallic colours for your nails or if you're on the hunt for a different kind of shade, definitely give this one a go! 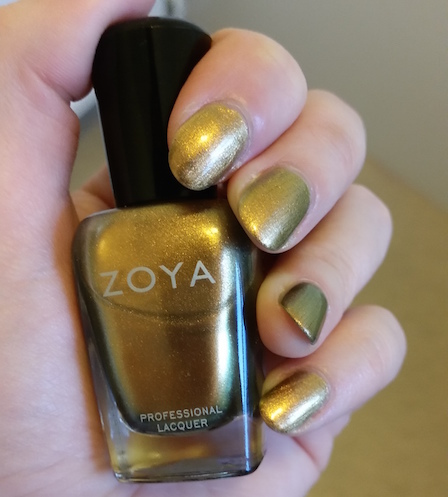 You can purchase Zoya's Aggie along with the rest of the Focus and Flair collections for £9.95/14ml from Nail Polish Direct or $9/14ml from Zoya. 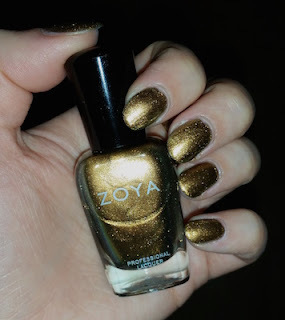 What are your thoughts on Zoya's Aggie Nail Polish? Which is your favourite of the Focus and Flair collections?